Be the first to share your favorite memory, photo or story of Mrs. Allene . This memorial page is dedicated for family, friends and future generations to celebrate the life of their loved one. 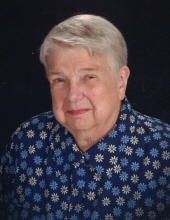 Mrs. Allene Frances Derganz Wakefield, age 86 of Carrollton, Georgia died Tuesday, March 19, 2019. Mrs. Wakefield was born in Westmoreland County, Pennsylvania on March 11, 1933, the daughter of the late Albert Derganz and Alice Crenner Derganz. She was retired mathematics coordinator with Coweta County Schools and member of Our Lady of Perpetual Help Catholic Church. Survivors include her husband, L.W. Wakefield; daughters and son-in-law, Tamra Wakefield, Janet and Owen Walker; sons and daughter-in-law, Roger Wakefield, Jamey and Kim Wakefield all of Carrollton; grandchildren, David(Olivia Wilson) Simmons, Emily (Russ) Denney, Rachel Wakefield; niece and nephews. Besides her parents, she was preceded in death by her son, Phillip Wakefield; brothers, Al Derganz, Paul Derganz, Rick Derganz and sister, Bettiann Drogos. The family will receive friends at Almon Funeral Home on Friday evening from 5 p.m. until 7 p.m.
Funeral mass will be Saturday, March 23 at 10 am at Our Lady of Perpetual Help Catholic Church with Father Mario Lopez officiating. Pallbearers will be Kenny Ingle, Chuck Powers, David Simmons, Kent Donaldson, Steve Hipp and Russ Denney. Interment will be in OLPH Catholic Church Cemetery. "Email Address" would like to share the life celebration of Mrs. Allene Derganz Wakefield. Click on the "link" to go to share a favorite memory or leave a condolence message for the family.